Procurement Manager is Head of Procurement Management Unit of the Fund and Secretary of Fund Tender Board. Responsible for performing and supervising all duties pertaining to procurement matters and providing technical expert advice to the Director General on such matters. •Prepares a procurement plan that is commensurate with the needs of the Fund and ensures that the plan is adhered to as much as possible. •Secretary to the Fund Tender Board. •Deals with tender documents and procedures for procurement. •Organizes the management of Fund stores to ensure that procurement are handled in an efficient and effective manner. •Maintains up to date database of the Fund’s fixed assets. •Assists Regional offices in maintaining sound procurement systems and procedures for items that those offices handle on their own. •Provides the Director General with advice on all matters relating to procurement management. •Undertakes performance appraisal for staff under him/her. •Prepares periodic reports on the status of procurement in the Fund.
. A minimum period of six (6) years of relevant work experience, at least three (3) of which shall be in a similar senior position in a reputable organization. Excellent interpersonal skills, ability to communicate clearly and concisely both orally and in writing, good analytical and problem solving skills, Good working knowledge of ICT Applications and procurement package(s). 1.1. Terms of Engagement Five (5) years contract, renewable. •Supervises: Community Health Fund Manager and Donor Funded Interventions Manager.
. The outputs of this position are reflected in the effectiveness of the Fund’s role in the monitoring of Community Health Fund. •Formulates and reviews the CHF policies, regulations, rules and procedures in a view of guiding and enhancing CHF coverage and operations. •Formulates work programmes for the directorate and supervises their implementation. •Oversees the CHF enrollment and extension of coverage of the scheme. •Ensures effective systems and procedures for service delivery to CHF members and other stakeholders. •Oversees adherence to CHF Act, guidelines and by-laws. •Determines and proposes possible areas for partnerships with other stakeholders for CHF implementation. •Oversees partnership programs with development partners. •Oversees the maintenance of proper and up-to date records and statistics of CHF members. •Oversees CHF sensitization programmesto communities. •Ensures policy makers,influential leaders and other stakeholders are well vested with the CHF activities. •Prepares periodic performance reports of the Directorate. •Maintains contacts and rapport with stakeholders in the social health insurance sector. •Performs any other related duties as may be assigned by the Director General. A Master’s Degree preferably in Business Administration,Insurance, Public Health Financial Management,Health Economics, Social Security Administration, Management or equivalent qualifications plus a minimum period of eight (8) years of relevant work experience, four (4) of which shall be at a Management position in a reputable organization.Experience in social health insurance field will be added advantage. Aspirant for this post should be a person who leads by examples, inspires others, encourages risk-taking, fosters team work, leverages diversity, focuses on results, discovers and pursue opportunities, persistent and able to lead change. 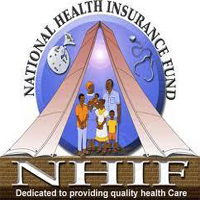 All posts carry an attractive remuneration package in accordance with the NHIF Schemes of Service and Staff Regulations. Interested persons who meet the qualifications given above are required to submit their well written application lettersenclosing certified copies of academic and professional certificates,a detailed CV with one current colored, passport size photograph of applicant attached on the first page of the CV. The applicant should also provide two names of his/her refereesin the CV, indicating their telephone numbers, e-mails, postal and physical addresses. One referee must be from the current/ latest employer.